Way back in April 2010, I re-discovered a specialty ruler that quickly became my newest, most favorite ruler. :-) It makes an equilateral triangle in a square block. I used the blocks I made to contruct borders for two toddler charity quilts, Sawtooth Star #1 and Sawtooth Star #2. 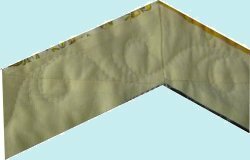 In my unending enthusiasm for this ruler set, I just kept making equilateral triangle blocks ... mountains of them! Since it was SO very easy to make them, in typical Pirate fashion, I think I went overboard. :-) I ended up making a lot of these blocks. A whole lot. Tens of them. Hundreds of them. Inkle-dillions of them. Well .. maybe not quite *that* much, but a HUGE number of them. They were just that easy to make! I cut some yellow strips. 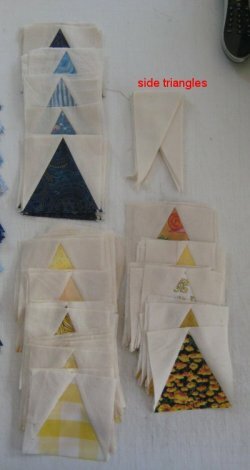 And then some muslin side triangles. And made a whole bunch of equilateral triangle blocks. But did I mention that it was REALLY easy to make these blocks? It was kinda like eating popcorn ... you just keep munching away. 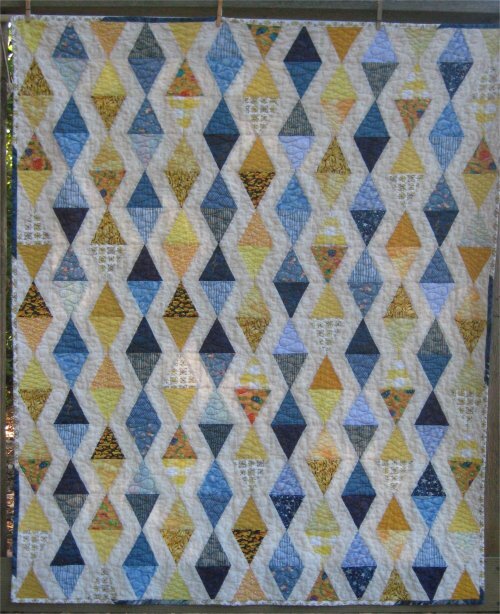 In this case, I just kept chain sewing those triangles and side pieces and made all those gorgeous little blocks! I ended up with a messload of them. Really ... uncountable piles of blocks. I realized the best way to use all of them was to put them in a quilt all by themselves. Originally, I thought to make a quilt for "my" Crisis Nursery charity (which are smaller quilts); this particular size was 40" x 52". As I was pinning the blocks up on my design wall, I was liking it more and more. So much so that I decided to keep it, rather than donate to the Crisis Nursery. :-) (Not to worry, I'll do more blocks in a bigger size and donate that one). Now, it is utterly beyond me WHY I am using up my SCRAP basket stuff, when, if I stuck to my To Do List and used YARDAGE, it would make a bigger hole/dent in my fabric stash *and* I could cross a project off my list. Sometime in June 2010, the top was pieced. 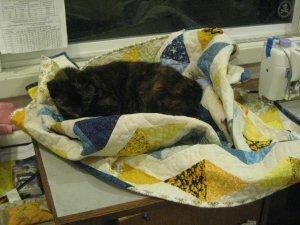 Lizzie was being worked on (an encoder cable turned out to be faulty and needed replacing) and since I couldn't quilt the top right away, it got put on the Pile of Quilt Tops to be Quilted. It wasn't until October 2010 that I had the opportunity to load the top on Lizzie. 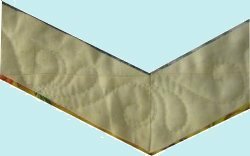 It occured to me that the zig-zag path through the triangles would be an excellent vehicle to practice all the variations of Carla Barrett's Swirly Curly sashing design. I've loved the basic version so much and have used it often, but I hadn't tried any of the other ones. The zig-zag path seemed just the perfect way to try them all as a sampler. 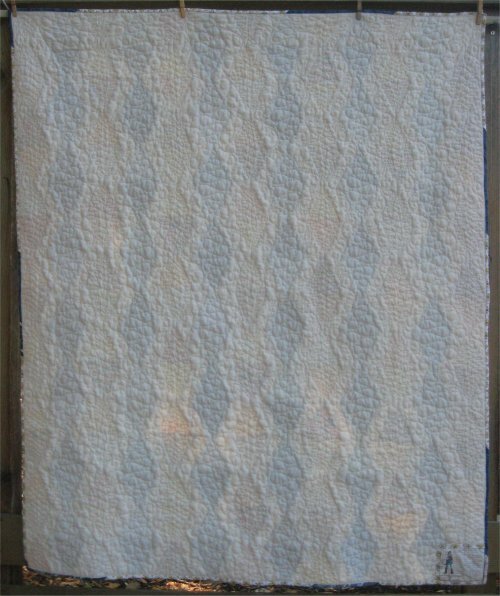 Using Superior King Tut (color: #971, white linen) gave a nice tone-on-tone effect ... the quilting is there but not in-your-face. For the triangles, I didn't want anything real fancy because that might overpower the swirly curlies in the zig-zags. I wanted something low-key and unobtrusive. Then it hit me! I would do a Lazy Eight in one color triangle and Ribbon Candy in the other! Absolutely *perfect*! 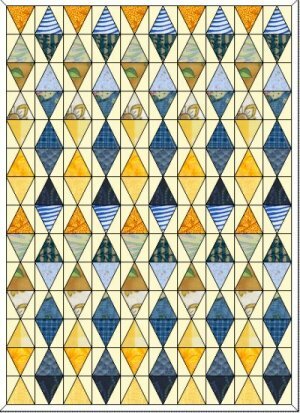 I used Superior King Tut (color: #934; Nile Delta, a variegated gold-yellow-lime) in the yellow triangles and Superior King Tut (color: #915; Suez, a variegated aqua-med blue-periwinkle-lt blue) in the blue triangles. I loaded the quilt sideways (called 'railroading') so that the length would run parallel to the rails. 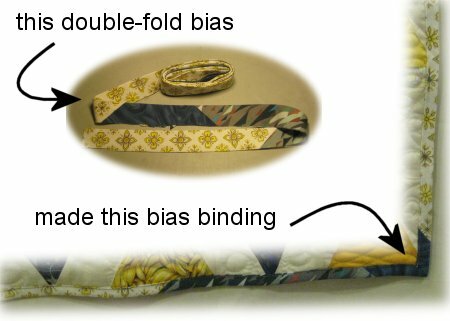 This would let me quilt one entire zig-zag or triangle row in one pass, making the quilting go much faster and look better. 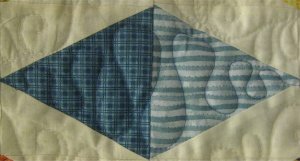 I did all the zig-zags first, advancing the quilt until all the zig-zag paths were quilted but the none of the triangles. 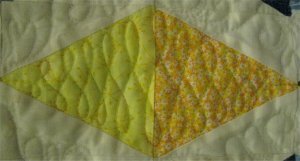 Then I switched the top thread to the yellow and quilted only the yellow triangles in the Lazy Eights design, advancing the quilt in the 'reverse' direction ... from the belly bar to the take-up rail, advancing the quilt until I was back at the take-up rail. 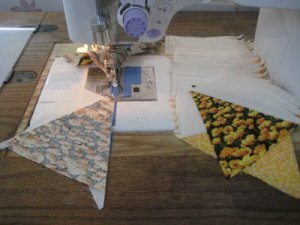 At that point, I changed the top thread to the variegated blue and quilted the Ribbon Candy in all the blue triangles, once more advancing the quilt until I was at the belly bar. 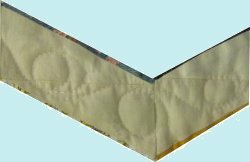 At that point, the entire surface had been quilted. Oh my! Look at the texture on the back! 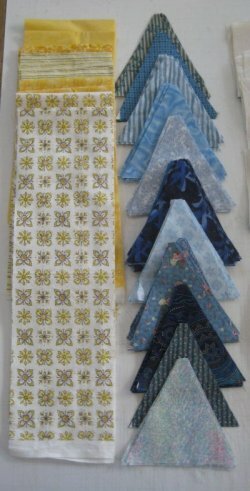 Finally, as in many of my scrappy quilts, I like to make custom bias from strip sets made up of fabric used in the top. After all that, would you believe that I have still MORE equilateral triangle blocks? :-) Yes, in fact, I do. Furthermore, I've even made another top from those blocks ... not quilted yet, though. 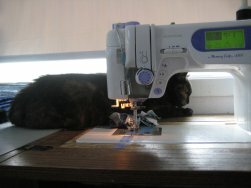 No quilt is complete with the Quality Assurance Officer.